The Corporate Madonna | Fourth Dimension Inc.
A case-study on socially responsible entrepreneurship based on the autobiography of Anita Roddick, the founder of the Body Shop. The compassionate revolutionary; uplifting social and environmental vision; feminine touch; spiritual dimension; vision in action; value auditing. A mighty soft revolution is sweeping through the world, especially in the corporate world; it is the increasing invasion of woman into what is normally considered in the past as male domains like for example leadership and entrepreneurship. 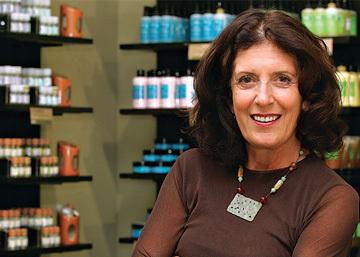 Anita Roddick, the founder of Body Shop, is one of the leading representatives of this revolution. She is the archetypal woman-entrepreneur who brought her feminine passion and a compassionate social conscience into business. If Madonna (not the pop diva, but the virgin Mother of God in Michael Angelo’s famous sculpture, Pieta), represents passion and compassion, then Anita Roddick can be called as the Corporate Madonna. She is not a saintly Madonna but a revolutionary one, who constantly went against the conventional corporate wisdom. She once said, “I carefully watch the current trends in business and do the opposite.” She is also a courageous Madonna who ventured into the forests of Sarvak to photograph illegal logging and into the Amazons to set up trading links with the Kayapoo tribes. The last part of the intro to her autobiography gives a glimpse of the character and temperament of the author and comes straight from her passionate heart. Increasing emphasis on renewable resources for raw materials and infinitely recyclable components for machinery, driving towards “zero-emission” of pollutants, not only within the company, but also for suppliers. The Body Shop started in Canada in 1980 and by 1992, the Home Office, production, distribution, and training facilities had grown into four separate buildings. From the start, the vision for the new headquarters was of a soul space. First, in keeping with the company’s commitment to recycling, a decision was made to recycle an entire building. Instead of demolishing an existing building or constructing a new one, the firm purchased and recycled a thirty-five-year-old printing warehouse in an industrial zone of Toronto. The company actively campaigns for human right causes like violence against woman. The store windows of Body Shop are used extensively for such social and political campaigns. The company measures its progress and performance in terms of its values.